Plenty of trainers and athletes have been running hills since the dawn of sports training, and for a good reason too – it works. Running on an incline demands that you use your own body weight as a form of resistance while trying to travel upwards. This is excellent because adding unnatural resistance (weighted vests, ankle weights, etc.) in many cases will disrupt your running technique, and thus make the workout less productive and increase your risk for injury at the same time. But, when done properly, hill sprints can improve a hockey athlete’s acceleration, explosiveness, and top speed level. When running on an incline, you force yourself to change your mechanics without anyone even coaching you. Your stride length shortens slightly. You maintain a low and driven upper body angle. It helps heel-to-toe runners switch to running on the balls of their feet. It avoids shin splints for those with ankle/tibialis issues. It lowers hamstring injury risk during running due to increased activation of the glutes during extension. And you force the body to lift the knees higher with each stride to push forward. …pretty good so far right? But I think we still have a cherry on top here, they’re free. Everybody has a hill in their neighborhood and you’re not going to need any expensive, fancy equipment. Just you, your shoes, and a stopwatch. That’s all we’ll need to increase your acceleration, top speed, explosive power—and drop plenty of body fat along the way. Outside of the physical development, there is a mental component to this as well. You don’t need me to tell you how important mental toughness is for hockey. It translates into being able to handle a crazy in-season schedule, intense off-ice training schedule, and juggle all your school, life, and job responsibilities as well. There’s something unique about making it to the top of a hill, and beating the time you did it in previously. It feels brutal, but the feeling of satisfaction you create from breaking through new barriers carries right over into game day. A mentally stronger version of you is a physically stronger version of you. If you have never done a hill workout before, it’s very important that you warm up and increase your heart rate before you start getting into the serious part of the workout. 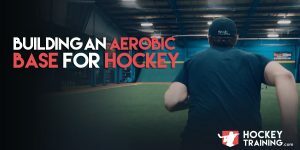 You should use any of the warm-ups I have already written about in articles here at Hockey Training, or, we have plenty of examples on our Hockey Training YouTube channel as well. But, if you’re zapped for time, just jog for 10-15 minutes or so and throw in a few dynamic stretching movements. Beginners should also be aware of the hills they are choosing. The goal isn’t to find the steepest hill in the world, a nice steady incline of 30-45 degrees is likely best in almost all scenarios. For your first workout, don’t go crazy. Your muscles and tendons aren’t used to this type of work yet and sprinting drives some high-level forces throughout the body, so you do not want to risk injury. 3-6 sprints of 20-35 yards is going to be more than enough. Your rest period should be relatively short as well, just run back up the hill after you have walked back down. After this, finish up with some core exercises and then you’re on your way home. Moving on to the folks who want to enter the big leagues for hill training! Now that you’re mindful of the hill you’re working with and you have developed both the energy system conditioning as well as the muscle/tendon conditioning you need to not get injured on these hills, you’re ready to take things up a notch. At this stage, I’m assuming you are following my pre/intra/post-workout nutrition and hydration guidelines, you’re going to need this type of support here for performance and recovery. Week 5: Deload, no hill sprints. Week 10: Deload, no hill sprints. The above would be a logical way to progress into the advanced category for hockey conditioning. But eventually, it would be great to have you at 12-15 hill sprints per workout while still being fast in the later rounds. Rest periods for the veterans can and should increase as now we are passed the general conditioning stage (beginners) and want to be moving in the direction of increasing your total power output per run. Rest periods can be anywhere from one to three minutes in between each run. Beyond the advanced range of hill sprinting tactics already mentioned above, you can use a variety of other tactics as well to increase total training volume per workout, disperse the training load to other muscle groups, and allow for a more complete lower body workout while still not using any equipment. These advanced techniques can all be added in from time to time to enhance the training stimulus for more speed, explosiveness, and acceleration. The only note I want to make here is that I wrote uphill before all of those for a reason, I really don’t recommend doing any downhill work. 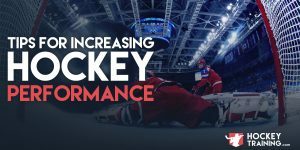 If you’re jumping or sprinting downhill, you’re going to create very large forces on your knees which hockey players already have enough problems with from skating. Avoid the downhill work, and focus on everything you can do uphill. Hill training is a form of HIIT training since it is highly intense bouts of effort separated by low-intensity bouts of effort (walking back down the hill), but the hill has many unique added benefits that other forms of conditioning do not, making it a welcome addition to any hockey speed or conditioning system. Drink plenty of water, enjoy the sun, and love the grind! Ready to take your game to the next level? 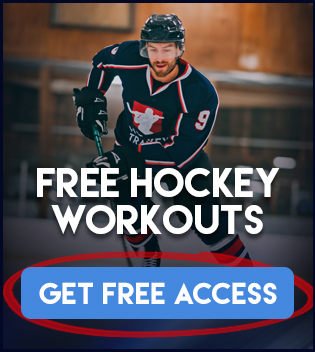 Check out our full hockey training programs and join the HockeyTraining.com team today! Funny, no hills in Houston either, but home in Sweden by my parents there are :-)! Actually, we sometimes do running training on Saturday mornings in an empty parking garage to get the hills :-). How often would you do this workout? Of course this depends on what your program looks like as a whole — but ideally yes. Hill sprinting, although excellent, shouldn’t be the only means of which you do your conditioning. It should be additive, and not absolute. Once per week is good.